As Stardust, his blockbuster recording from 1978 attests, Willie Nelson has a fondness for American standards. Considering how durable compositions like Night Life, Hello Walls, and Crazy have been over the years, it’s safe to say that he’s penned a few of his own, too. As these facets of his personality prove, Nelson’s artistry extends beyond his talent as a songwriter. He also is a skilled interpreter, who ceaselessly has sought new ways of revitalizing older material, whether it’s his own or someone else’s. In a career that has been filled with strange twists and turns, Nelson’s latest outing Two Men with the Blues undeniably has sprung from left field, though it also offers yet another circuitous route back to his roots. The collection was culled from the concerts that he and his longtime harmonica player Mickey Raphael performed with Wynton Marsalis and his band at the Lincoln Center’s Allen Room over the course of two nights in mid-January 2007. It is, quite frankly, the epitome of two masters who not only have managed to meet each other on common ground but also have found a telepathic connection that allows them to play in perfect harmony. 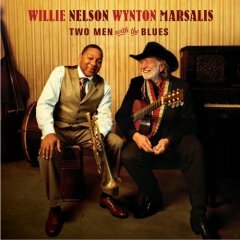 In crafting Two Men with the Blues, neither Nelson nor Marsalis had to bend his approach to assuage the other’s style. Nelson playfully delivers each lyric with his customarily casual charm, and he laces the material with stinging, blues-inflected blasts from his weathered acoustic guitar. At the same time, Marsalis and his outfit listen closely to the words that Nelson is singing, and they respond in kind, guiding and shaping the mood of the arrangements until they find something new to say. There have been moments when Nelson’s Night Life has exuded an air of melancholy weariness. With Marsalis’ help, the song retains its late-night ambience while also striking a more confident posture. Elsewhere, the yearning in Nelson’s voice as he delivers Stardust is countered by the optimism in Marsalis’ trumpet solo. Nelson, more than most artists, seems to enjoy sharing the stage or the recording studio with his peers, followers, and influences. His canon is stuffed to the brim with collaborations, some that have worked and some that haven’t. Two Men with the Blues is, without a doubt, one of his more successful gambits. Throughout the disc, Marsalis always manages to find the perfect counterpunch to Nelson’s calm, measured vocals. He emits bombastic brays from his trumpet as effortlessly as he answers with something more lyrical and soothing. The spirit of New Orleans festers inside each of the outing’s 10 tracks, though the western swing that Nelson revisited on You Don’t Know Me: The Songs of Cindy Walker also is never far from reach. In the end, Two Men with the Blues goes a long way toward softening Marsalis’ reputation as a strict traditionalist without offending his conservative sensibilities. Simultaneously, Nelson’s outlaw persona is toned down enough that the performances are able to provide further illumination on his musical perspective. Finely honed and deeply compelling, Two Men with the Blues is a magnificent example of artistic grace, poise, and beauty. It swings, and it saunters; it laughs, and it cries. One can only hope it is the beginning of a bold new partnership rather than a mere diversion from business as usual. Two Men with the Blues is available from Barnes & Noble.